Nurse practitioners are extremely valuable to the medical community and patients. NPs are not physicians, but they know their stuff. The education requirements to become a nurse practitioner (a.k.a. Advanced Practice Registered Nurse) have gotten even more robust. That means nurse practitioners are even more skilled than before and can handle more complex medical cases. Nurse practitioners can specialize in many different areas of medicine, but the most common is the Family Nurse Practitioner (FNP). As a parent of three kiddos, it’s no surprise that we frequent our pediatrician. Without the help of the FNPs on staff, the practice wouldn’t be able to accommodate all of the sick visits we have to make. It’s nice to be able to call the children’s clinic, get in quickly and help our kids get on the mend. It’s a win-win. We can get our kids quality care, and the physicians can deal with the checkups and more complex visits. But with more training comes more student debt. The good news is that NPs are in high demand and can finish their education at a relatively low cost compared to the average nurse practitioner salary. Plus, many of them are eligible for favorable loan repayment like Public Service Loan Forgiveness (PSLF). 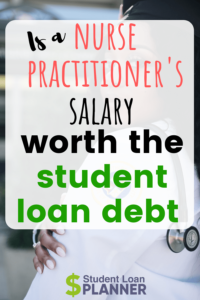 So is the nurse practitioner salary worth the student debt? Not too long ago, NPs could get a Master’s of Science Degree in Nursing (M.S.N.) after two years, costing them between $20,000 and $40,000. They could then start earning close to $100,000. Now employers are seeking NPs with their Doctor of Nursing Practice (D.N.P.) degree. This four-year program doubles the years of school and more than doubles the cost of becoming an NP. As I said before though, everyone benefits from more-skilled NPs. A nurse practitioner who takes the online program at Baylor University (based in Texas) could expect to spend $82,500 for the 75 credit hours it takes to go from their bachelor’s degree — a Bachelor’s of Science in Nursing (B.S.N.) — to their D.N.P. An Iowa resident could attend the University of Iowa with an estimated cost of $86,047. The actual cost ends up being more than that, though. Higher living expenses, tuition increases each year, interest accruing on the loans and leftover loans from undergrad push the cost of earning a D.N.P. well above what’s anticipated. The average NP we’ve worked with here at Student Loan Planner has about $149,000 in student loans. This is on the rise due to the tuition hikes. The average nurse practitioner salary is around $110,000 per year. With a D.N.P., the average nurse practitioner starting salary is about $96,000, which is about $10,000 more than a nurse with an M.S.N. and about $36,000 more than a nurse with a B.S.N., according to a Payscale survey. The salary can vary by state too, according to ZipRecruiter. The nurse practitioner salary in New York is the highest followed by Massachusetts, Maryland, California and…Nebraska? The average NP salary in Texas is about $92,000, which is surprisingly near the bottom. Florida is the second lowest average salary for nurse practitioners, about 23% less than New York. Yet even the lowest nurse practitioner salary may be worth the extra cost to obtain a D.N.P. compared to the average college graduate. So becoming a nurse practitioner leads to an extra $44,000 in earnings per year by the averages. Let’s assume that $44,000 in extra income sustains throughout the entire 40-year career of a NP. That works out to an extra $1,760,000 in lifetime earnings for a D.N.P. compared to someone with a bachelor’s degree. That’s a huge number! Taking out $149,000 in loans to make an extra $1,760,000 tends to make financial sense on the surface, but remember those extra earnings will be taxed. We also have to factor in the cost to repay the student loans. If we assume a combined 40% tax rate for federal and state, then we can reduce that $1,760,000 in earnings down to about $1,056,000 in extra take home pay. So now we’re talking about N.P.s having an extra $1,056,000 to pay off the $149,000 of student loan debt. Seems good on the surface, but we should dig deeper. Let’s explore the cost of paying back the D.N.P. student loans to see if it makes sense. Aggressive Pay Back: For people who owe 1.5 times their income or less (e.g. a nurse practitioner who makes $100,000 with loans at $150,000 or less), their best bet could be to throw every dollar they can find into paying back their loans as fast as possible, in 10 years or less. NPs should be sure to look at their PSLF options before refinancing. Often this includes refinancing student loans to get a better interest rate. Pay the least amount possible: For nurse practitioners who owe more than twice their income (e.g., $100,000 salary and $200,000 or more in student loans), the goal is to get on an income-driven repayment plan that will keep payments low and maximize loan forgiveness, whether it’s through PSLF or taxable loan forgiveness. The nurse practitioner employer (nonprofit or private practice) could be the biggest factor in choosing between either option. Let’s say Melissa has $150,000 in student loans at 6.8% interest. She’s been a nurse practitioner in Texas for three years and was paying on the graduated plan to keep her payments low. Right now, she’s making $100,000 at an employer that would qualify for PSLF with projected 3% salary increases for the foreseeable future. She’s not married. In almost all circumstances, the graduated plan is going to end up costing a nurse practitioner more money than they’d otherwise have to spend when paying back their loans. The graduated plan is neither option 1 nor option 2 listed above and is much more costly. Melissa will end up paying off a 6.8% loan in full over 30 years with increasing payments every 2 years. It sounds like a good idea to help with monthly cash flow, but 99 out of 100 times, it’s one of the worst repayment options. Choosing PSLF or refinancing to a 10-year fixed rate will both cost less than that. So let’s compare starting on the PSLF path now versus refinancing to a 10-year fixed rate. It’s important to see the difference in going for PSLF on Pay As You Earn (PAYE) versus Income-Based Repayment (IBR). You can see being on IBR would cost Melissa about 50% more to pay back her loans compared to PAYE. Nurse practitioners with student debt who are eligible for PAYE should almost never be on IBR. As for PSLF with PAYE versus refinancing, PSLF is the clear winner. It’s projected to cost about $100,000 less then refinancing — $94,210 versus $195,118. But should Melissa be beholden to a nonprofit employer just to get PSLF? When is it ok for a nurse practitioner to forgo PSLF? Melissa likes her job working for the nonprofit hospital. But she got an offer for a private practice job where she’d earn $125,000. That’s an above-average nurse practitioner salary in Texas. Would it make more sense financially to stay where she is and get PSLF? Or to take the new job, give up PSLF and make more money but have to pay off her loans in full? The job move could mean her student loan repayment could cost $100,000 more over 10 years. That works out to paying $10,000 per year. In other words, her take-home pay would have to increase by more than $10,000 for the year. All of that extra money would have to go toward paying back the refinanced loan to break even with PSLF. But Melissa is going to make an additional $25,000 in private practice and take home $15,000 more per year. If she pays an extra $10,000 toward her loan each year, she’d still have an additional $5,000 in take-home pay. Now that makes financial sense! If Melissa and I were having a discussion about this, I’d let her know that refinancing means giving up PSLF for good. So we might talk about taking the job but keeping her loans in the federal program until she’s certain she wants to stay in the private arena. When she’s 100% certain, she’d want to refinance her loans to drop the interest rate down from 6.8% into the 5% range. Is becoming a nurse practitioner worth the cost? The pure financial answer is yes since the projected lifetime earnings of a nurse practitioner versus the average college grad is $1,056,000 after taxes. This is compared to the $195,000 estimated cost of paying back student loans with the more costly path. Either way, most nurse practitioners should have a goal to be student debt free in 10 years or less, whether they refinance and pay it off in full or go for PSLF and save aggressively on the side. Just like any profession, D.N.P. candidates should only pursue this path if they’re all in and student loans won’t make them regret their decision. Having a clear understanding of how loan repayment works and how to mitigate both the financial and psychological aspects of carrying that amount of debt are a must before entering school. Nurse practitioners can find a clear path to pay back their student loans. A path that could not only save them significant money but help them understand the actions steps to get it done. If you’re a nurse practitioner and have questions about your student loans, feel free to email me at rob@studentloanplanner.com.